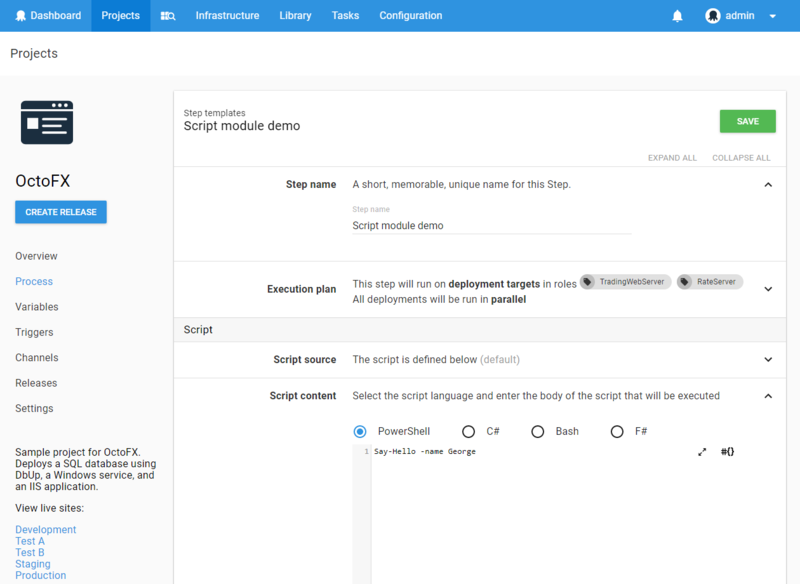 Script modules allow users to create PowerShell functions or Cmdlets that could later on be used in deployment processes across multiple projects. You can think of them as regular PowerShell Modules that will get loaded at deploy time. By default, your new script module will come with a function called Say-Hello. We will modify it a bit with the following code for the sake of showing a better example. Write-Output "Hello $name. Welcome to Octopus!" Once this is done, click on Save. The script modules get loaded once for every step on your deployment process. If you process has 4 steps (i.e Stop IIS, Backup ,Deploy, Start IIS) the entire module will get loaded once at the start of each step. Because of this we encourage users to avoid putting code outside functions on your Script Modules. This way the code will only get executed when the function is properly called from a PowerShell Script step. In the example Script Module below, the first line which attempts to stop the service "ImportantService" will run for every PowerShell-Script-based step on your deployment . The first time it might succeed (stopping the service), but the subsequent tries will most likely make the overall deployment fail. 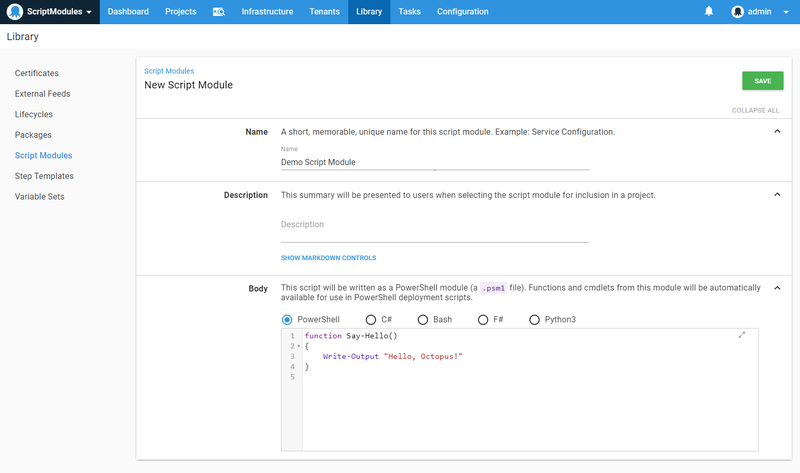 Once you have created a Script Module, you can start using the functions contained on it on your deployment processes. Go to your Deployment Process and click Include. A new window will pop up up, prompting you to select you script module. Select the module you just created (make sure the checkbox is checked) and hit Save. Add a Standalone PowerShell Script step and call the Say-Hello function from it. Once you're done, hit Save. 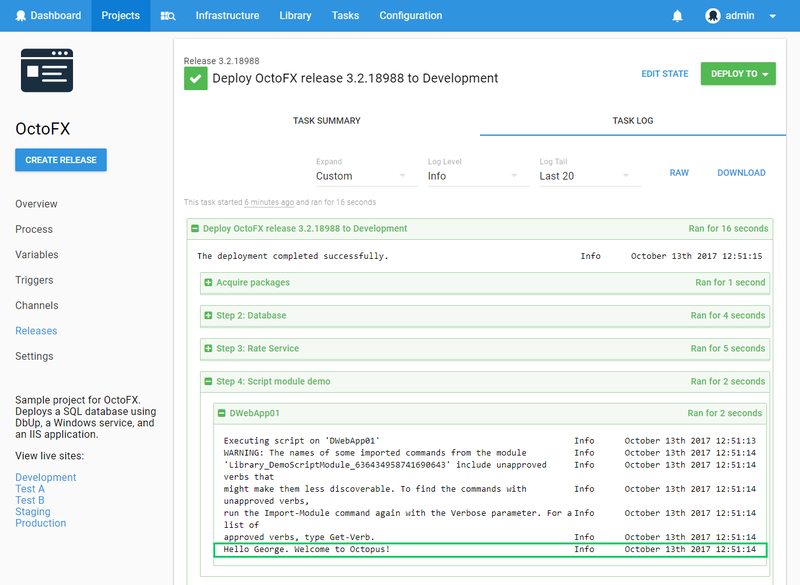 Create and Deploy a release. 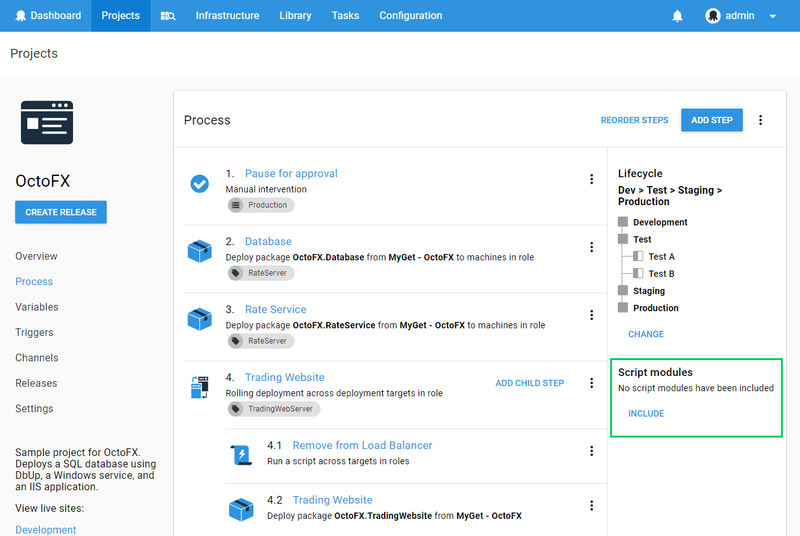 Check the Release task log and expand all the steps. You should be able to see the output of the Say-Hello function in there. To see the Script modules menu requires the VariableView permission. To create a new Script module requires the LibraryVariableSetCreate permission. To view an existing Script module requires the LibraryVariableSetView, VariableView and VariableViewUnscoped permissions. To edit an existing Script module requires the LibraryVariableSetEdit permission.